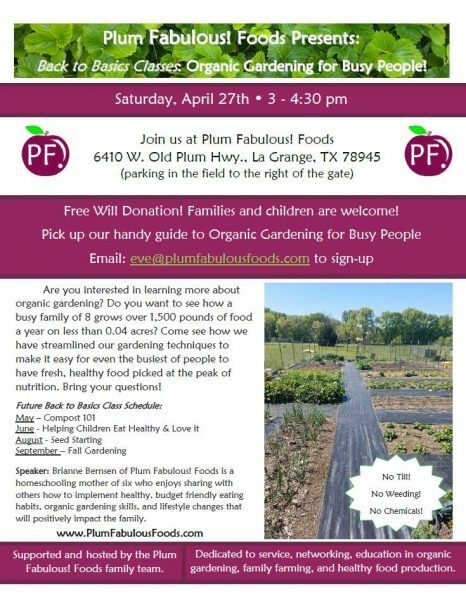 Are you interested in learning more about organic gardening? Do you want to see how a busy family of 8 grows over 1,500 pounds of food a year on less than 0.04 acres? Come see how we have streamlined our gardening techniques to make it easy for even the busiest of people to have fresh, healthy food picked at the peak of nutrition. Bring your questions! Use the Contact Us! page to sign-up! back to eden gardening, sq ft gardening. Bookmark. Copyright 2019 by Plum Fabulous! Foods, All Rights Reserved.